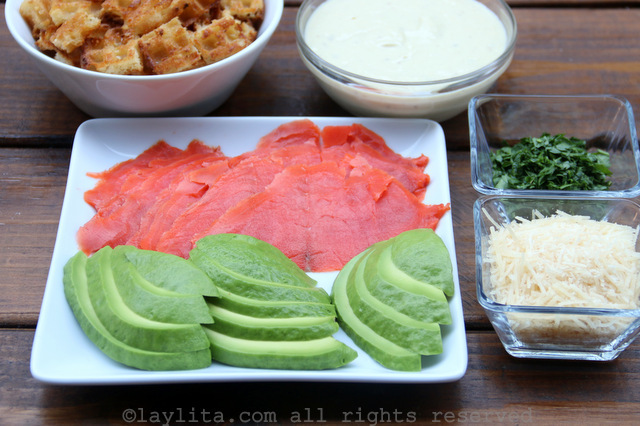 This smoked salmon and avocado Caesar salad is very easy to prepare and can also be customized based on your preferences. You can omit the smoked salmon or use leftover grilled fish; you could also use soft boiled eggs or grilled shrimp/chicken. 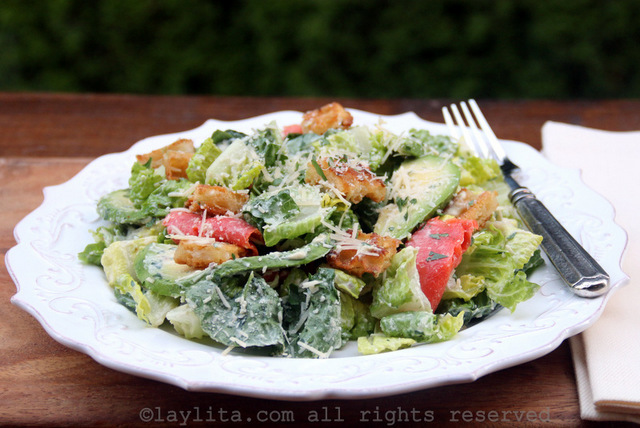 The dressing is made with plain greek style yogurt – instead of mayonnaise. I did add a couple of anchovy fillets to the dressing, but feel free to omit them if you’re not fan, or try just one small fillet – the flavor will be very subtle. My kids, like most kids, don’t like anchovies, and actually didn’t even notice that I used them in the dressing. 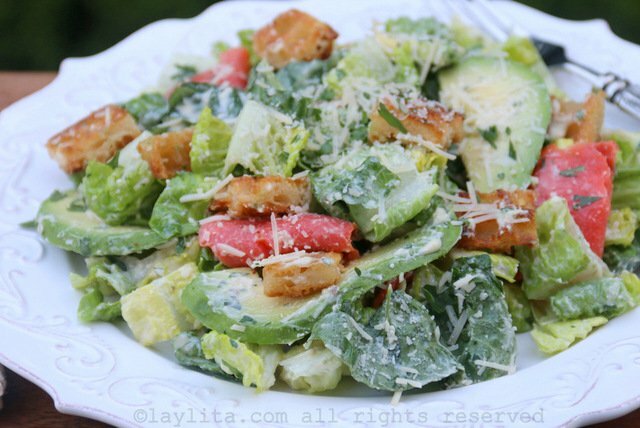 Recipe for caesar salad with smoked salmon and avocado, topped with garlic croutons. 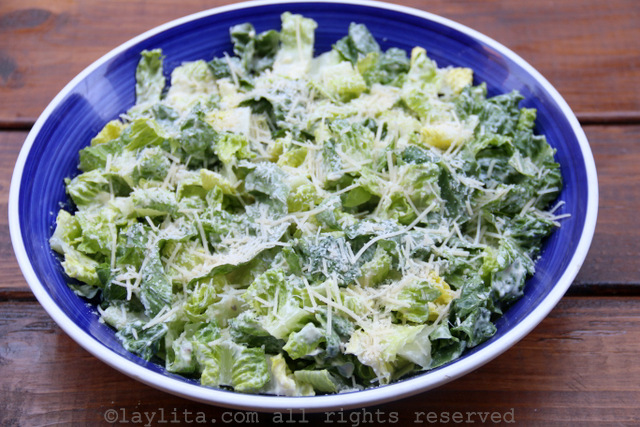 The Caesar salad dressing can be made with yogurt instead of mayonnaise. 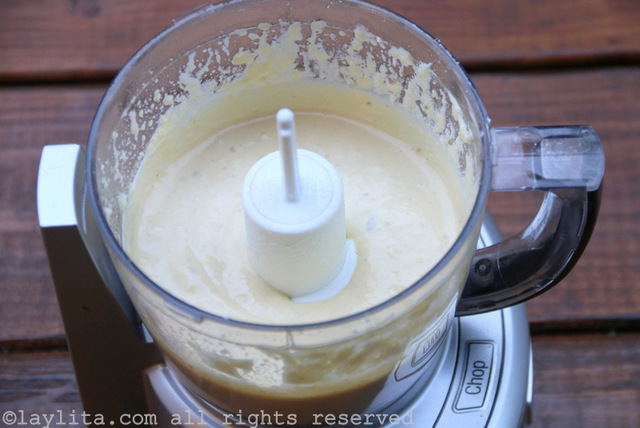 Combine all the ingredients in a small food processor and mix until you have a smooth sauce and the olive oil is well incorporated. Taste and adjust as desired. Refrigerate the dressing until ready to use. Mix the butter with the garlic. Spread the butter onto the lightly toasted waffles and cut them into small pieces. Place the bread/waffle pieces on a baking sheet. 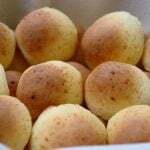 Place the baking sheet under a hot oven broiler for about 4-5 minutes, then turn them over and broil for another 2-3 minutes, or until nice and crispy. Exact times will vary based on each oven, keep an eye on the croutons while they’re under the broiler. 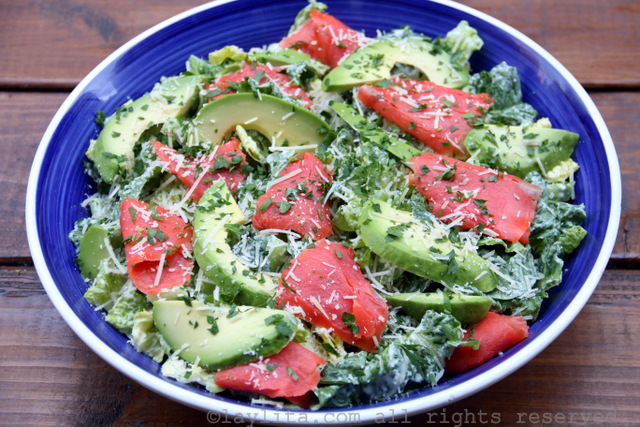 Toss the romaine lettuce pieces with the salad dressing and 1 tablespoon of the grated parmesan. 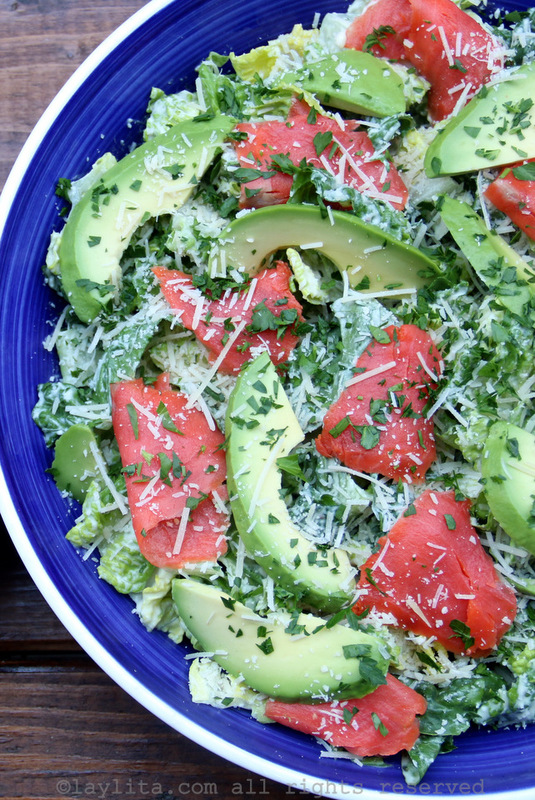 Top with the croutons and sprinkle with the chopped parsley and remaining parmesan. I’ve made your dressing three times now, and it is a ready standby in my home. 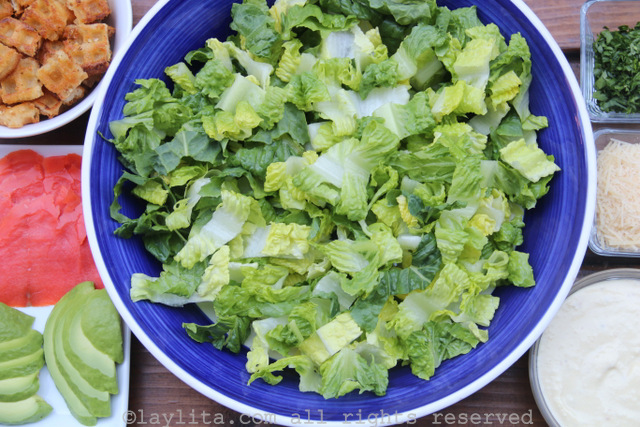 I keep romaine lettuce stocked,and with your dressing on standby,I always have a Caesars salad ready to go. All I have to do is decide on the protein. Thanks! ???? 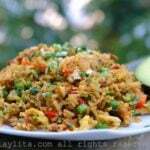 This recipe sound very good and healthy.